Thought of the day – what is your earliest memory? What is your earliest memory? Mine is my third birthday party! 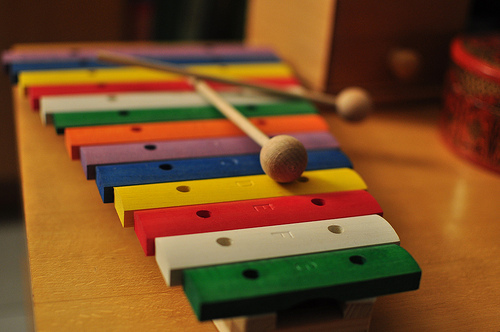 I remember getting a xylophone – it was bright, colourful and made a lot of noise! I sat beside the Christmas tree playing with this great new toy, my back to all my little party guests! If you think back to your earliest memory you might come up with something similar to mine… well maybe minus the xylophone, the noise and the antisocial behaviour…. but you might find your earliest memories start about the same age. Is this when we first start to form memories? Do we need to reach a sufficient level of cognitive and language skills to do so? Apparently not! Studies have shown that we do form memories from a much younger age, however, these memories can be lost as we age, so, effectively our earliest memory milestone keeps moving. Children as young as two or three may give valid events as their earliest memories but they may not be able to recall these memories if asked again a few years later. So when do our set of early memories settle down to what we carry into adulthood? Usually by the age of ten! Why do most of us have our earliest memory from an event around the age of three…. Studies are ongoing with regard to what factors may influence our earliest memories but some interesting facts have emerged such as suggestions that females tend to have earlier memories than males and that there does not seem to be any bias towards positive or negative memories. Also, we are as likely to report our earliest memory being of a mundane nature (like me and my xylophone) as of a significant event. Some research that I found particularly interesting was the influence of culture on the age of earliest memory. In cultures that promote discussion with children from a young age about themselves and their feelings and thought, earlier memories are more likely to be reported. This is particularly true for cultures that put a strong emphasis on the past (such as New Zealand Maori). Asian cultures tend to put less influence on a child as an individual and more on a group or national mentality, and these cultures tended to report an older age for first memories. What is your earliest memory? I would love to hear your earliest memory and what age you were when the event took place!